In Trump's First 100 Days, A Dramatic Reduction In Immigration From refugees and visa holders to asylum seekers and illegal border-crossers arriving at the southern border, the flow of immigrants to the U.S. has plummeted. 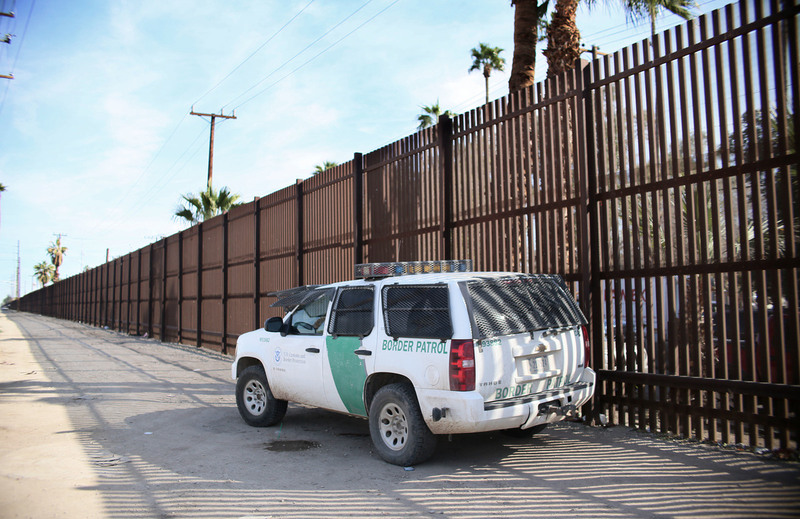 A Border Patrol agent looks over the U.S.-Mexico border wall in Calexico, Calif., on Jan. 31. Apprehensions at the southern border fell dramatically: from more than 40,000 per month late last year to 18,754 in February, and just 12,193 in March. Nearly 100 days into his administration, President Trump has drastically reduced the flow of immigration, both legal and illegal, to the U.S. He's been able to accomplish that without any new legislation — and without many of his signature ideas solidly in place, including executive orders that have been put on hold by the courts and a proposed wall on the Mexican border. In a matter of months, the Trump administration has made it harder to get into the U.S for all kinds of people. From refugees and visa holders, to asylum seekers and illegal border-crossers arriving at the southern border, the numbers have plummeted. And this may be just the beginning. A leaked draft of a progress report shows that the Department of Homeland Security has begun laying the groundwork to do more. The agency has identified more detention beds for immigrants in the country illegally, set aside money to start designing the border wall and sped up the hiring of thousands of federal immigration agents. "There's an effort now to deter, to terrify," says Donald Kerwin, executive director of the Center for Migration Studies, a think tank in New York devoted to protecting the rights of migrants. Kerwin says even Trump's own rhetoric is aimed at deterring immigrants. "What they're trying to do are very splashy, draconian enforcement efforts that are really meant to tell people: nobody is safe, and nobody should come that's not documented," Kerwin says. That message may be getting through. Apprehensions at the southern border fell dramatically from more than 40,000 per month late last year to 18,754 in February, and just 12,193 in March. The administration is going out of its way to highlight those numbers. "Last month was the lowest month for immigration illegally into our country in 17 years," said Attorney General Jeff Sessions at a news conference in El Paso, Texas, last week. "That is a remarkable thing to accomplish." Away from the border, arrests by immigration agents were up by about a third during the first three months of the year, to 21,362, compared with 16,104 during the same period in 2016, according to data provided by U.S. Immigration and Customs Enforcement. The data also show that federal agents are arresting more unauthorized immigrants who don't have criminal records: 5,441 during the first few months of the year, compared with 2,278 last year. A senior official with Immigration and Customs Enforcement tells NPR that the agency has been able to "open the aperture" on the types of immigrants it can target. Reactions across the country reflect a divided America. "We're seeing mothers and fathers torn away from their families, many with no criminal histories at all, or with just minor past convictions," says Tom Jawetz, a vice president at the Center for American Progress, a left-leaning think tank in Washington. Robin Hvidston sees it differently. She's the director of We the People Rising, an organization in California that advocates tougher enforcement. "I have not heard a presidential candidate in my lifetime address this topic," Hvidston says. "And I think he does want to take action against more criminal activity." Courts have twice blocked Trump's effort to suspend the U.S. refugee program. In the meantime, the administration has simply stopped accepting as many refugees. The numbers have dropped significantly: from nearly 10,000 a month last fall to just 2,070 in March, according to the State Department's Bureau of Population, Refugees and Migration. "We still have families who are separated, who we want to see rejoined," said Rebecca Liberato, a case manager in the Jersey City, N.J., office of Church World Service, a refugee resettlement agency. "They're scared for their loved ones across seas as well." Just this week, a court in San Francisco blocked another Trump executive order, this one punishing so-called sanctuary cities that limit cooperation with federal authorities. But that's not stopping the administration's agenda. In fact, it's signing up other cities to help enforce immigration law.